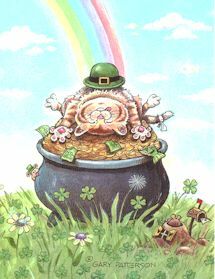 Here is a Gary Patterson cat lying on its back atop a pot of gold. Inside greeting: Hope you find your own pot of gold today! Happy St. Patrick's Day. The card is 4 3/4" wide x 6 3/4" high. Printed in the USA on recycled paper with soy based inks. Green envelope included.